The Jack plane is hands down my favourite hand tool. Its name is rumoured to have come from the popular saying 'Jack of all trades', which is exactly what this plane is. Every woodworker needs to have a Jack plane in their arsenal, even if every other tool they own comes with a power cord. 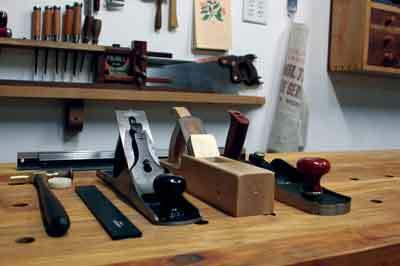 In a traditional hand tool progression of work, rough stock would be dimensioned to size and roughly to square using the scrub plane, followed by the Jack, and then the jointer and smoother. 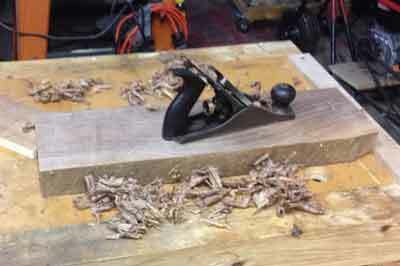 However, in a pinch, the modern metal Jack plane can actually accomplish all of the above tasks. With the frog set back to open the mouth of the plane, one could insert a heavily cambered blade - the bevel of the blade is ground at an arc to look like a beaming smile - into the Jack body, advance the blade far forward to take a heavy cut, and voila! The Jack is a scrub. If one were to replace the heavily cambered blade with a slightly less cambered blade - a smirk - retract it slightly and move the frog forward, then the Jack is back to its original form and function. Then, with the frog advanced even further forward to close up the mouth of the plane and the cambered blade replaced with a square ground blade - a stern gaze - it could pinch hit for a jointer or a smoother. 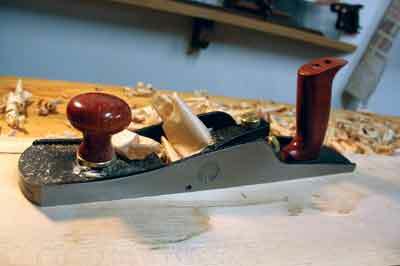 Also worthy of mention here is the fact that a Jack plane with a square blade is an ideal candidate for use with a shooting board to square up end grain. However, for the purposes of this article, let's focus on the Jack in its 'intended' state. Planes ranging from 305-430mm usually fall into the 'Jack plane' category. The Jack plane comes in many forms, be they the chunky wooden versions of days gone by, Chinese and Japanese wood planes that operate on the pull stroke, the sleek wooden push models offered by boutique makers like Crown Plane, Scott Meeks and Caleb James today and the metal bodied No.5 - using the standard Stanley numbering system, which most subsequent plane makers also adopted - offered in vintage varieties by Stanley, Bailey, Sargeant, Millers Falls and others. 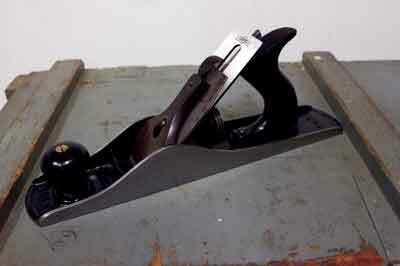 Makers of the more modern variety ductile iron-bodied planes, such as Lee Valley and Lie-Nielsen also make very high-quality Jack planes that work fantastically right out of the box. As previously mentioned, the blade on a Jack plane should be slightly cambered. 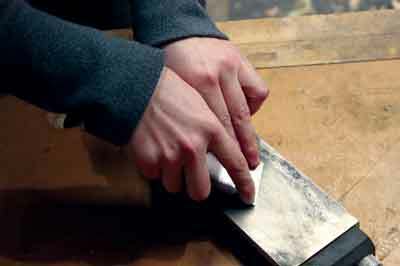 This can be achieved by putting added pressure on the sides when honing the bevel side of the blade on your sharpening stones, first on one corner, then the other. This process is made much simpler by using a honing guide, which will hold the bevel at the proper angle while you hone along the arc. So, how do you use the thing? 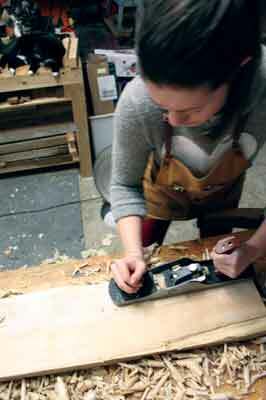 Volumes can - and have - been written about this topic, by craftsmen far more experienced than I, so I will give a quick recap and then let you get to practising in your own 'shop. 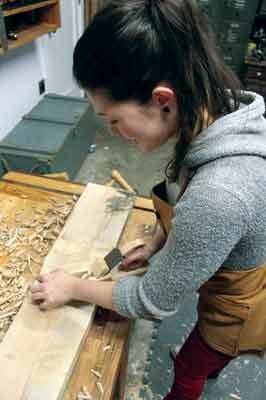 Hand planing is an activity where most of the strength comes from your core, not your arms. Set your non-dominant foot slightly forward with your dominant hand on the rear handle of the plane. Hand and feet should mirror one another wether you're left- or right-handed. You always want to maximise the amount of contact - registration - with the sole of the plane and the workpiece to achieve even downward pressure through the plane where the blade is cutting. As you begin your cut, focus your pressure on the front of the plane, then as you advance forward, transfer to the middle, and as you leave the cut, switch to the back of the plane. Your body should reflect this shift so focus rocking back and forth with your feet planted firmly as you lean into the cut and follow through to the end of the cut in one fluid motion. If you can't push the plane through the cut and you know the blade is sharp, then you have your blade set too deeply. If it's not cutting at all, you need to advance your blade forward in small increments. Practise noticing the change in feeling as the blade dulls so you can keep your plane sharp. When prepping a rough-sawn timber, start by planing at 45° across the board - sometimes called traversing - first in one direction then the other until you are taking a full shaving with each pass. Focus on the high spots and be careful to avoid any low spots until you've planed the entire surface down to their level. If your workpiece is rocking, place shims under the high spots so your plane can register with even pressure across the board. Next, begin planing in the direction of the grain, typically along the length of the board, from one side to the next with your plane slightly skewed at 10 or 15° - until youâ€™ve removed the marks from planing at 45° and are again taking a full shaving with each stroke. Check regularly for high or low points. Mark them with a pencil and when the marks are planed away, check again. When you are taking a full shaving along the length of the board, it should be flat and ready for smoothing. Some great tools to have on hand for this process are a pair of winding sticks, a quality straightedge and a double square. The Community Tool Chest currently has three Jack planes in it, each with their own special story and purpose. The first is a vintage Stanley No.5 and is one of my most treasured possessions because it was a gift from my dear friend Frank, a local woodworker who I've adopted as a surrogate grandfather, whether he likes it or not. He is actually the originator of the theme of my website, 'Anne of All Trades'. For the last three years, he has been encouraging me to learn every life skill possible and to preserve disappearing life skills. He is an incredible woodworker who has been producing masterpieces out of his workshop for 60 years. When I first asked him if he would spend some time teaching me some of the lessons he'd learned, I was shocked: he said he was grateful I'd asked. I was the first person who'd ever asked him to give lessons and had it not been for my asking, 60 years worth of woodworking knowledge would have died with him. Frank is 93 going on 25. He and I spend at least one afternoon a week together working on various projects, ranging from lathe work to installing irrigation in the yard to building a moped from scraps. I could write a book about him, but for the purposes of this article, I will say that this plane was given to him by an uncle and then he gave it to me. Someday I hope to give it to one of my grandchildren and I'll tell them all kinds of stories about my good buddy Frank. A twin to this vintage plane could likely be had at a flea market for about Â£10, but with a little clean up and a fresh blade from Hock Tools, it is easily worth 10 times that price, but the story and relationship that accompanies mine is priceless. The second is a beautiful wooden Jack plane donated to the CTC by Jim 'the tattooed woodworker' at Crown Plane. Jim and I met about a year ago on Instagram and I was very excited to be able to add one of his planes to the CTC after I'd had a chance to test a few out at Woodworking in America '14. Because of a small cosmetic flaw Jim was able to fix with an ebony (Diospyros spp.) plug, the plane had 'character', preventing it from being sold but it works like an absolute charm for purposes of the CTC. When it arrived, I went to touch the blade up on my stones before use and was shocked that the blade back was absolutely 100% dead flat right out of the box. That saved me a good half an hour in setting the plane up and I was immediately hooked. While I am still not totally used to the lack of mechanical features found on a metal plane, my arms and back thank me when I choose to use this much lighter wooden plane to do big jobs. The chips escape the plane easily, the blade holds a fantastic edge and once you get the hang of getting the blade set, this is a really sweet plane for a very reasonable price. At the end of the year, this plane and the other tools donated outright to the CTC will be given to a young woodworker as part of the CTC scholarship programme. 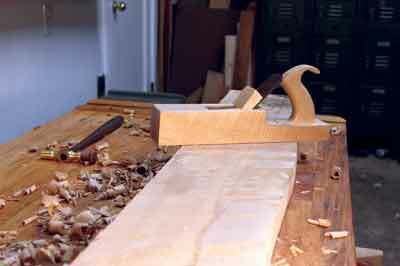 The third Jack in the Community Tool Chest is my Veritas bevel-up Jack plane. This is one of the first new planes that I ever purchased, and, if a woodworker were to only own one plane - but that sounds like a horrible way to live - then this would have to be it. Having been a frequent Lee Valley customer and having had the chance to spend some time with Robin Lee, the president of Lee Valley tools as well as many other key members of the Lee Valley team, I cannot recommend this company highly enough. Mr. Lee is passionate about getting the best quality tools affordably into the hands of woodworkers as well as using constant innovation to improve time tested designs. Their customer service is unmatched. But back to the plane. I love the versatility of my Lee Valley bevel-up Jack plane. I can open or close the mouth simply by loosening the front knob with hand pressure, the blade is thick, which reduces chatter - vibration while cutting - there are set screws in the sides of the plane so I can remove the blade for a quick sharpen without losing my setting and the bevel-up feature is fantastic when it comes to planing end grain, using the shooting board and dealing with figured maple (Acer saccharum), the main staple in my Pacific Northwest 'shop. Don't have a workbench? No problem! Clamp a scrap piece of timber to the edge of any work surface and voila! A plane stop! Not enough holding power? 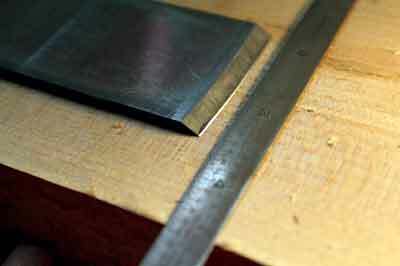 Simply cut an angled notch in a second scrap and clamp that to the surface against the opposing edge. This is called a batten and there is plenty of free information about them online.